Today has been a nice day spent at home with Jamie, which doesn’t necessarily mean it has been a relaxing day, relaxing with a 2 year old just doesn’t really happen, but he is happy for Mummy to do some dot dot (stamping) – sometimes, just as long as he still has my attention most of the time! 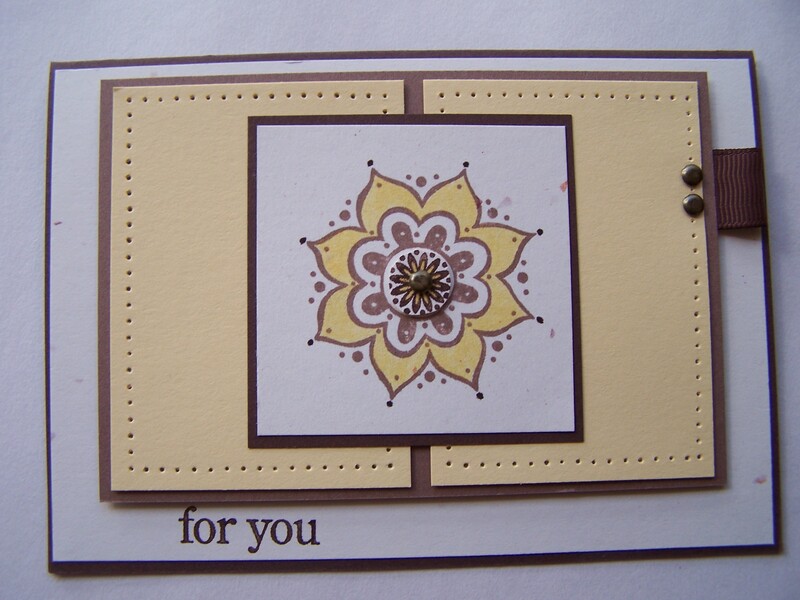 So I thought I would take the opportunity and share a card that I CASEd from one of my favourite stamping artists, Silke Ledlow . I have used the same layout and colours but changed a few things around. Accessories: Vintage Brads, Chocolate Chip Grosgrain Ribbon, Matt Pack and Piercing tool, Dimensionals.